One of the familiar clichés that have always been identified in mainstream horror cinema is that ‘the black guy or gal is always the first to get killed or tormented‘. Well, for once the black targets in the revealing and refreshingly insightful documentary ‘Horror Noire: A History of Black Horror’ earns their staying power with a candid look at how the black presence in horror cinema has progressed and, in some cases, regressed during the last century. This is an inviting and noteworthy commentary on a particular aspect of filmmaking that gets constantly overlooked. No doubt horror enthusiasts, ranging from casual followers to diehard scholars of gore-and-more flicks, will embrace ‘Horror Noire: A History of Black Horror’ with legitimate curiosity and intrigue. The documentary is based on Dr. Robin R. Means Coleman’s book of the same name. Director Xavier Burgin and screenwriters Danielle Burrows and Ashlee Blackwell delve into the meaty material and expose the resourceful nuances that heralded black personalities contributed to the art form of horror-induced entertainment throughout the years. Interestingly, a who’s who of black artists are on board to expound upon their experiences and recall the critical impact that surrounds their participation in this ebony-friendly realm of fear and scare. From fetching horror honeybuns Paula Jai Parker, Rachel True, Loretta Devine, and Kelly Jo Minter to the kings of creep in Tony Todd, Keith David, Miguel A. Nunez Jr. the field of these selective souls that gave their all to the creepy craft is remarkably realised. Specifically, innovative and adventurous black moviemakers such as Jordan Peele’s racially-observant breakthrough boofest ‘Get Out’ infectiously caught the box office attention of all moviegoers regardless of skin tone. There is no doubt how comprehensive and significant ‘Horror Noire: A History of Black Horror’ is to the American psyche, particularly shaping the negative imagery of black consciousness on the big screen being reduced to insufferable buffoonery and devastating stigmatised stereotypes in the early golden years of Hollywood horror-style campiness and crassness. Soon, the revolving door of branded black goosebumps would emerge in the form of 70s blaxploitation films in horror where African-Americans would take charge and stage their version of soulfully cheeky jumps-and-jolts. Fittingly, black audiences could relate and feel at ease because they were in on the joke at their expense because these specialised fright flicks were made for them in mind without ‘outside ridicule’ from non-blacks. Classics such as 1972’s ‘Blacula’, 1974’s ‘Abbey’, 1973’s ‘Ganga And Hess’, 1976’s ‘J.D.’s Revenge’, 1976’s ‘Dr. Black And Mr. White’ and later spooky offerings such as 1984’s ‘Black Devil Doll From Hell’, 1995’s ‘Tales From The Hood’ and 2001’s ‘Bones’ were guilty pleasures for black audience identification. Tony Todd knows the Candyman can…that’s for sure! ‘Horror Noire: A History of Black Horror’ is a thought-provoking think piece as it guides our minds to the various possibilities of black-oriented influences, decorated or degrading, and the gradual growth of horror films that feature the treatment of black talent on and off the big screen. It is both fun and daunting in pointing out the progression and pain of horrifying black notables. High points would be rare horror black leads such as Duane Jones playing the heroic Ben in 1968’s ‘Night Of The Living Dead’. Low points would include cartoonish blackface beasts in celebrated spectacles such as 1933’s ‘King Kong’. Craftily, unconventional ‘horror’ showcases of a different type and stripe would entice genuine discussions of societal ugliness for fantasy black existence in fear-mongering fodder such as 1915’s racist propaganda film ‘Birth Of A Nation’. The interviewees are the notable sources that add texture and truth to the face of black horror and all its vital perspectives. Whether ‘Candyman’ star Tony Todd or writer/scholar Tananarive Due interjects about the realities of black horror and its vast effect in a century of filmmaking one thing is perfectly clear, the acknowledgement of this kind of colour-coated commentary on the horror genre and all its sublets is a fascinating and stimulating take on unique cinema that seemingly flies under the radar. Predictably, current focus is hoisted upon the success of the aforementioned ‘Get Out phenomenon that made Tinseltown take special notice. 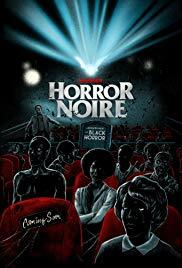 Profoundly invigorating and inspirational, ‘Horror Noire: A History of Black Horror’ suggests that the horror is not so much how blacks folks are mere playthings for macabre manipulation but how they for once can control the gory narrative of their on/off screen effectiveness in stomach-turning chills and thrills. Anyone ready for an updated version of ‘Scream, Blacula, Scream’? « Making Your First Blockbuster by Paul Dudbridge (book review).